Not only does this model offer a convertible form factor, it also supports Android apps. Chromebooks are great, but I have a very specific opinion about buying them. I want a price around $200, an Intel processor, and a minimum 32GB of onboard storage. Right now, Best Buy has just such a deal: You can get the Acer R11 2-in-1 Chromebook for $220. The only catch is you have to sign-up for a “My Best Buy” account to see the sale price, as this is an “early access” deal. This is a great price for this machine—and surprising to see so soon, given that we just saw this steep discount during last week’s Amazon’s Prime Day sale. For $220, you get an 11.6-inch touchscreen display with 1366-by-768 resolution, 32GB of eMMC flash storage, 4GB of RAM, and a 1.6GHz quad-core Intel Celeron N3160 processor. The N3160 is a pretty standard processor for Chromebooks, and it runs really well with Chrome OS since the operating system is so light. This clamshell weighs close to three pounds and is fairly thin. It has one USB 3.0 and one USB 2.0 port, HDMI out, an SD card reader, and 360-degree hinges. 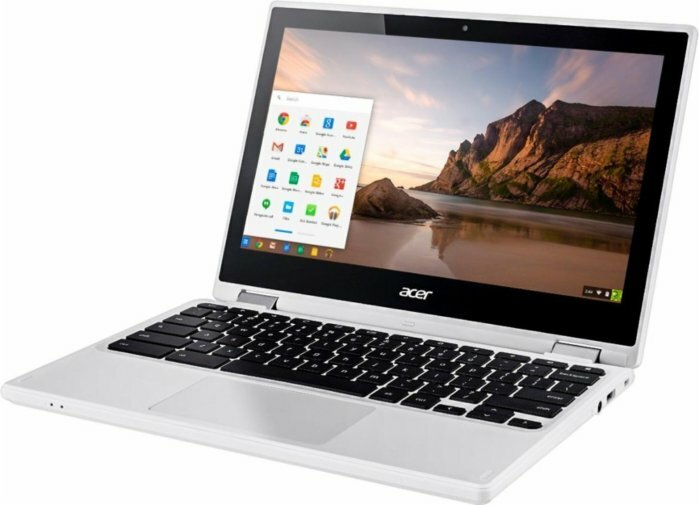 It would be nice if this model had a 1080p screen like other Chromebooks at this price, but balancing out the 1366-by-768 resolution is a touchscreen. On top of that, this device already has Android app support in the Chrome OS stable channel.